With digital game sales slowly overtaking physical releases, there could come a day when game collectors have nothing to collect but data. Publisher Limited Run Games is attempting to prolong the magic with small print runs of formerly digital-only games. Mighty Rabbit Studios’ nostalgia-crammed Saturday Morning RPG is getting a digital release on PlayStation 4 and Vita on January 26. Anyone can buy that. Only 1,980 PS4 and 2,500 Vita gamers will be able to secure official physical copies for their collection on January 29, courtesy of the folks at Mighty Rabbit’s publishing arm, Limited Run Games. Collector’s hoping to maintain a complete collection of PS4 or Vita games will want to stay on top of those releases. These are both official, Sony-sanctioned games complete with catalog numbers—the only thing missing is the ESRB rating necessary to sell them at retail. And who needs retail? Limited Run tested the waters with a 1,500 copy run of Breach & Clear for the Vita. It sold out in under two hours. 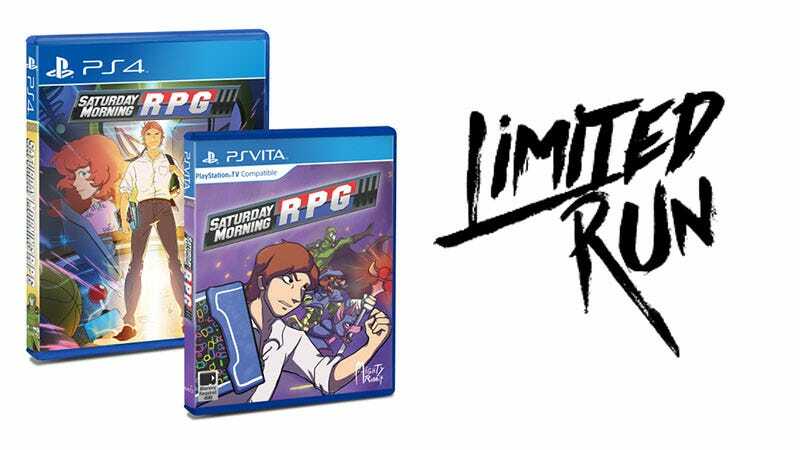 The Saturday Morning RPG physical editions go on sale January 29, with half being offered at 10 AM Eastern and the other at 6 PM. Being a much more entertaining game than Breach & Clear, I expect to not be able to secure one unless I am very lucky. “Our goal is to bring back physical games by taking previously digital only games and helping them become physical” co-founder Douglas Bogart said in an email to Kotaku earlier this week. So far the games in question have been a pair of Mighty Rabbit releases, but that’s due to change soon. Upcoming plans include a Vita release for Oddworld Inhabitants’ Oddworld: New N’ Tasty and Zeboyd Games’ Cosmic Star Heroine. So if you’re into physical game collecting, you should keep an eye on Limited Run Games’ releases. That, or wait until their games are twice the price on eBay.